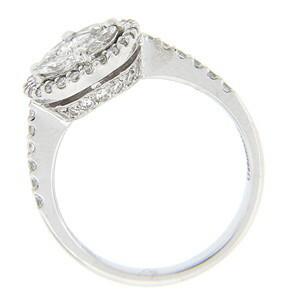 Four marquis cut diamonds frame a single round diamond on this 14K white gold antique style engagement ring. 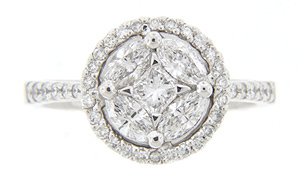 Surrounding the central grouping is a ring of smaller round diamonds. 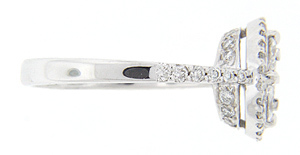 Additional diamonds are set in the ring’s shoulders in a single line. 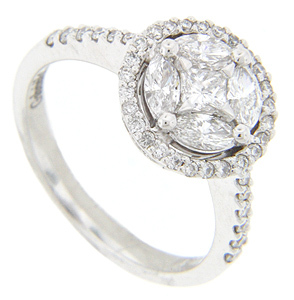 Set with 1.20 carats total weight of diamonds, the ring measures 11.3mm in width. Size: 6 1/2. We can re-size.